Ever wonder what to make with paper pieced fabric hexies? A tote is the perfect way to share your fabric love. This reversible tote is a snap to make, just follow the photographed steps. Find out how to make these gorgeous bracelets that will preserve your summer memories. A quick painting sketch of Birches in the snow. Painted from memory in a half an hour. Share the gift of creativity. Download my Paint Sheet and tuck it into a acrylic gift set. Follow the steps to make these surprising Easter Eggs. Miniatures are set into real egg shells with melted wax. 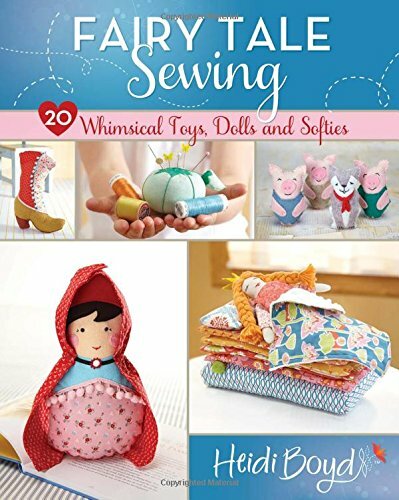 If you love gnomes and woodland sewing projects please check out my newest book Stitched Whimsy. In honor of National Craft Month I'm giving away two of my new Whimsy Stitching Kits. They include everything you need to make your very own stitched felt creation. I still have so many projects to share with you from my summer workshop series, but I'm skipping this gem to the top of the line up. Our young adult librarian had suggested making Thai String Dolls, and after a little research I realized that it could be an accessible and popular project. I had a blast making these dolls with a half dozen great teens. Teens will always keep you guessing... I knew this mirror project was going to be a hit with my DIY Friday library group. What I didn't realize is how much teens love collage and working with Modge Podge. It was the best project yet, everyone was relaxed, creatively engaged and in the end tremendously proud of their mirrors. I'll admit it, my job is the best. I play with art materials all the time for publication and then I get to take a break and share creative fun with kids in our community. This week our One World, Many Stories theme inspired my Bali Shadow puppet workshop. This ancient art has been practiced for centuries, as a way to honor religious beliefs and share folklore stories.